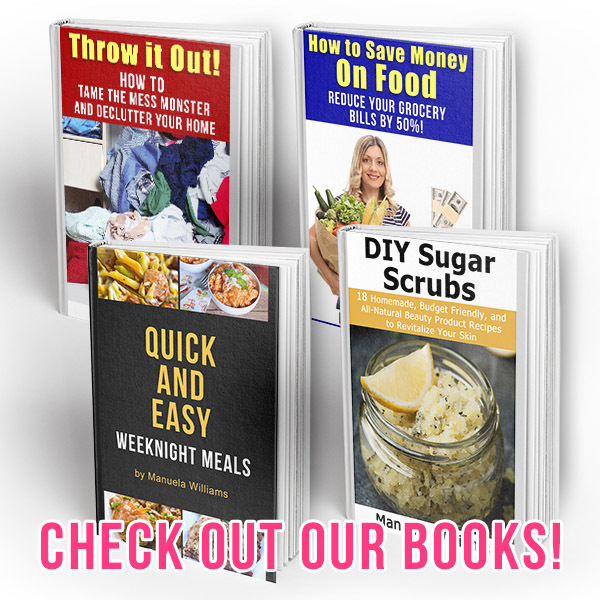 Now that it’s getting warmer, it’s time to keep the oven off and break out the no-bake recipes! But that doesn’t mean you can’t have any yummy desserts just because its hot out. Instead, use your fridge and freezer to make your treats! One of my favorite no-bake desserts for any time of year is chocolate bark. But then, I also love chocolate, so I guess that isn’t much of a surprise! 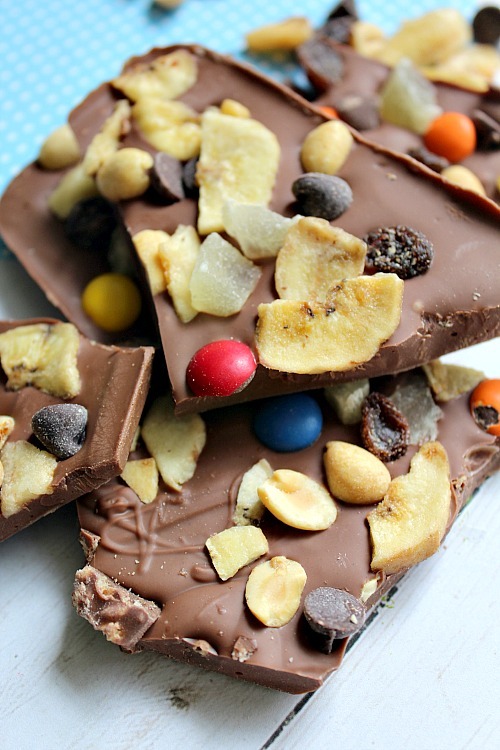 For a chocolate bark that includes some healthy, crunchy add-ins, make this Trail Mix Candy Chocolate Bark! Along with chocolate, I also enjoy snacking on trail mix. Its amazing how tasty some things can be when mixed together! 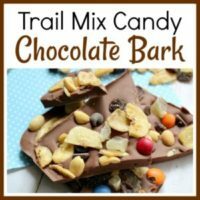 My daughter isn’t a big fan of trail mix, but she came back for seconds of this trail mix candy chocolate bark! So if you have kids, this may be a compromise kind of way to get them to eat healthy nuts and dried fruit. 1. With the non-stick cooking spray, spray all of your cookware thoroughly including your spatula, cooking pot, and baking dish. 2. Place the pot on low heat and add your milk chocolate chips. Start stirring immediately. This will not just help the chocolate chips melt evenly but will also prevent sticking and even burning. 3. Once the chocolate chips are melted completely smooth, pour the chocolate into the baking dish. 4. Use the spatula to spread the milk chocolate into an even layer. 5. Once you have an even layer of chocolate, you can sprinkle on the trail mix. Add as little or as much as you wish, creating a layer on top of the chocolate mixture. 6. 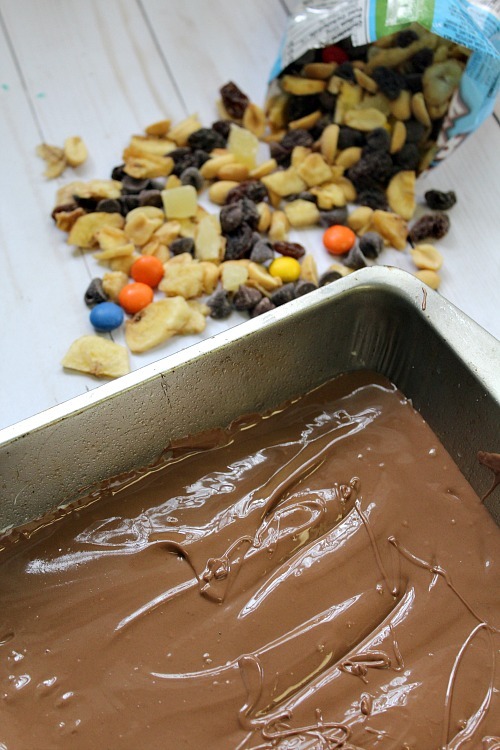 Give the trail mix a minute or so to naturally sink into the chocolate. 7. Transfer the baking dish into the refrigerator. 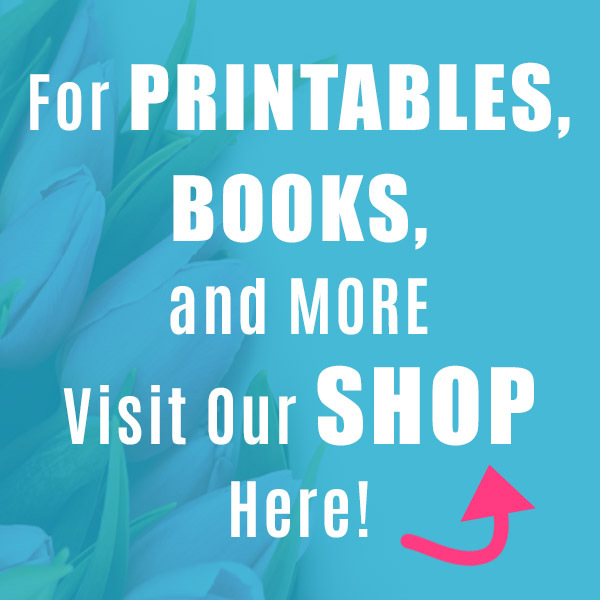 Make sure it is resting on an even surface. 8. Allow the baking dish to sit for one hour or until the chocolate mixture is solid. 9. Remove the baking dish from the refrigerator and use the knife to gently pull up the sides. The bark will come out as one sheet of candy. 10. Break the bark apart by hand before serving. You can store your trail mix candy chocolate bark in an airtight bag or container until you are ready to serve it. 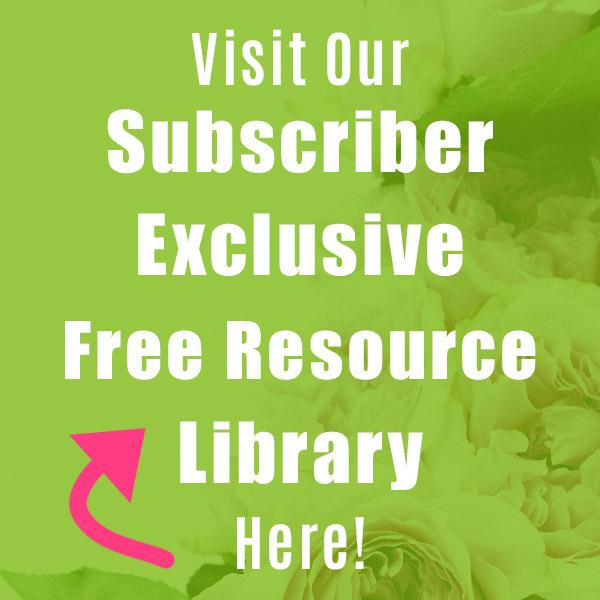 Keep it in a cool place (the fridge or even a pantry is sufficient) for safe storage. This bark can last for up to 2 weeks in the fridge. Do you usually like trail mix? 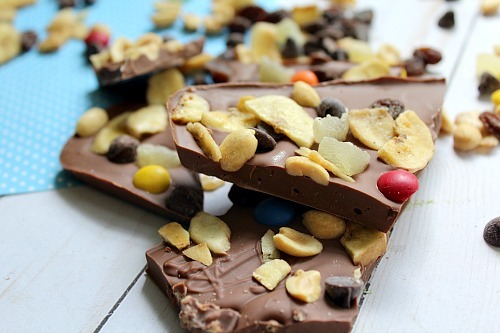 This trail mix candy chocolate bark is the perfect combo of sweet chocolate and crunchy add-ins. And since it’s a no-bake recipe, its easy to make! With the non-stick cooking spray, spray all of your cookware thoroughly including your spatula, cooking pot, and baking dish. Place the pot on low heat and add your milk chocolate chips. Start stirring immediately. This will not just help the chocolate chips melt evenly but will also prevent sticking and even burning. Once the chocolate chips are melted completely smooth, pour the chocolate into the baking dish. Use the spatula to spread the milk chocolate into an even layer. Once you have an even layer of chocolate, you can sprinkle on the trail mix. 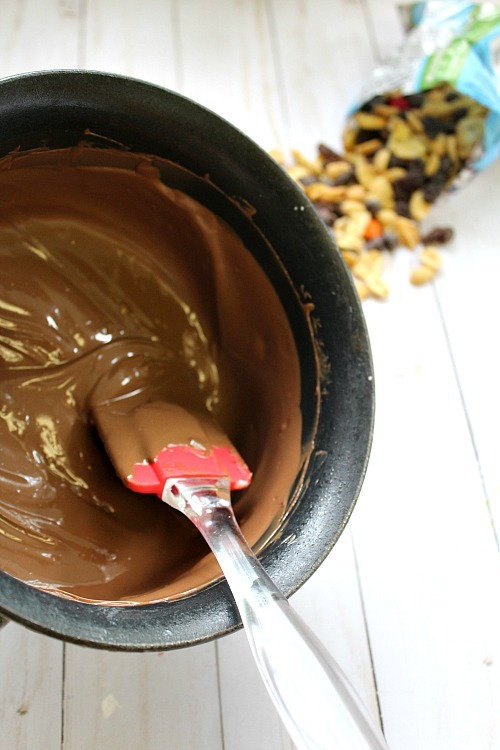 Add as little or as much as you wish, creating a layer on top of the chocolate mixture. 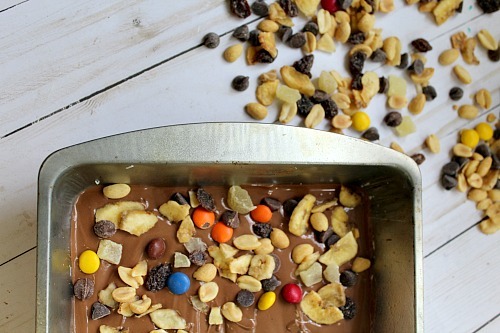 Give the trail mix a minute or so to naturally sink into the chocolate. Transfer the baking dish into the refrigerator. Make sure it is resting on an even surface. Allow the baking dish to sit for one hour or until the chocolate mixture is solid. Remove the baking dish from the refrigerator and use the knife to gently pull up the sides. The bark will come out as one sheet of candy. Break the bark apart by hand before serving.